Though psoriasis most often affects skin, it can affect nails as well. By understanding the symptoms you may help a client seek treatment before it gets out of hand. by Richard K. Scher, M.D. Psoriasis is a condition that affects the skin of approximately 5-8 million people in the United States. This disorder usually manifests itself on the skin, but a significant percentage of patients also have it on their nails. The cause of psoriasis is completely unknown. In some cases, it is only the nails that are affected by psoriasis. When this is the case, it is very common that the psoriasis is misdiagnosed as a fungal infection, simply because many physicians do not think of diagnosing just the nails as affected by psoriasis when the skin appears normal. It is understood by doctors, however, that both physical and mental trauma can be an aggravating factor. When psoriasis affects the nail matrix, three possible manifestations can show up. 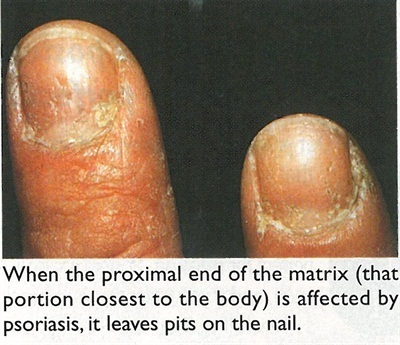 If it is the most proximal portion of the matrix that is affected (that portion closest to the body), psoriasis shows up as little dents on the surface of the nail plate (like pock marks or pits). When the middle portion of the nail matrix is affected, the clinical sign is a white spot, also referred to as leukonychia. 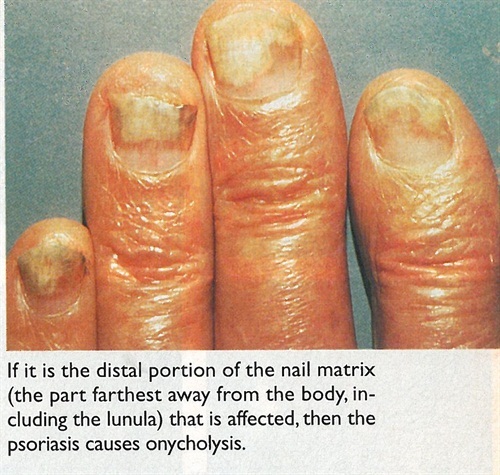 If it is the distal portion of the nail matrix that is affected (the part farthest away from the body and including the lunula), it causes onycholysis (separation of the nail plate from nail bed). Nail psoriasis occurs frequently with a type of arthritis of the fingers, called psoriatic arthritis. With psoriatic arthritis, there is usually swelling and redness of the fingertip or toe. Another common manifestation of psoriasis of the nail bed is splinter hemorrhages. These are little, tiny bleeding spots underneath the nail plate in the nail bed, which look like little splinters. There are many different treatments for nail psoriasis. The simplest, although admittedly, the least effective, are local cortisone creams, ointments, lotions, or gels. Topical medications don’t penetrate the nail well. In fact, the same is true for a new treatment for skin psoriasis called calcipatriol, which is a derivative of vitamin D, not a steroid. The most effective treatment for nail psoriasis is intralesional injections of cortisone in the skin around the cuticle and on the sides of the nail plate. Intralesional injections work best when they’re done after the nail is sprayed with a freezing spray to minimize discomfort. Ultraviolet treatment, which has been effective for skin psoriasis, has been used but is less effective on nails because UV light does not get through the nail to work where it is needed. Very strong medications, such as methotrexate and retinoids, have been used with some success for very severe cases of nail psoriasis. It is very important for nail technicians to learn to recognize psoriasis, because when nail psoriasis is treated by a physician and kept under control, the manicuring process and beautifying of the nails can be done much more effectively. Since physical trauma can aggravate or worsen nail psoriasis, nail technicians should avoid over-vigorous manipulation of the nails (excessive pushing back of the cuticles or cutting, for example) on psoriatic patients. When working on a client who has nail psoriasis — which is certainly all right to do — it is important to remember to treat those nails gently and without trauma. Psoriasis is not a contagious disorder so a nail technician’s main concern should be to make the client comfortable. Manicuring psoriatic clients is fine, but acrylic nails are not advisable. There is some evidence that acrylics can aggravate nail psoriasis, even though the objective is to camouflage or hide the nail abnormality. There is no problem, however, with the use of simple products such as nail polish. Nail technicians, therefore, are in an especially good position to recognize this condition when it occurs and provide good advice to their clients on how to proceed regarding having their nail psoriasis treated.